← The Moon’s Nodes – what will their Cancer/Capricorn transit bring? It was Moondark, just before a Capricorn New Moon on New Year’s morning 1919. 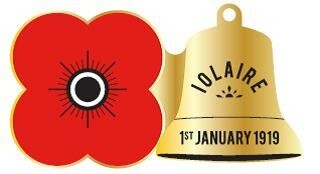 HMY Iolaire, an overcrowded naval yacht, under-equipped with lifesaving equipment, had set sail from the Scottish West Highland seaport of Kyle of Lochalsh on the 31st December 1918, carrying 283 war-weary sailors. As they approached the town of Stornoway on Lewis – where their families were waiting on the pier –the Iolaire struck the rocks known as the Beasts of Holm. Stormy weather made it almost impossible to reach the shore only 50 yards away. 201 of those on board died: literally within sight of home. There were 82 survivors. Around one third of the bodies of those who perished were never recovered. Apart from the loss of the Titanic in 2012, this disaster represents the second greatest loss of life at sea in the UK during peacetime. I had known for some time that there would be many moving ways in which those terrible events of New Year’s Day 1919 would be commemorated at the centenary. If any form of redemption was possible, then the generations arising – and especially those relatives whose lives had been marked directly or indirectly down the subsequent years – would enable it through their public events, their poetry, their music, their art. I became very conscious of the momentum towards commemoration building during a recent visit to Lewis in September 2018, and was moved by what I saw. However, I was unprepared by how deeply folk memory would affect me personally as 2018 drew to a close. By New Year’s Eve, I was feeling very emotional, almost tearful, despite our family’s Festive Season having been relaxing and peaceful. My spirits were invaded by a darkness and melancholy that I simply could not shake off. Then, on reading through some material on the Iolaire Disaster on the Web on New Year’s Day, I came across the precise time at which the Iolaire had struck the rocks. 1.55am. I put up the chart: stunning details struck me immediately. These men perished within sight of home. As the chart so tellingly points out, they never quite got there. As the minutes ticked by on that devastating night, Neptune, god of the sea, reached the MC of this horoscope, gradually claiming most of the lives of those on board by drowning. The next planet to come to the MC was Saturn, ruler of the IC. Grim Reaper Saturn’s message at its bleakest. In view of the Nodal axis’ having shifted into Cancer/Capricorn in November 2018, it’s most apt that the commemorations have been taking place with the transiting Nodes crossing the MC/IC axis of the Iolaire Disaster’s horoscope. Two weeks before the tragedy occurred on 1st January 1919, there was a 9th house lunar eclipse at 25 Gemini, opposite the horoscope’s 3rd house Moon at 25 Sagittarius, emphasising the theme of travelling both far and near, . 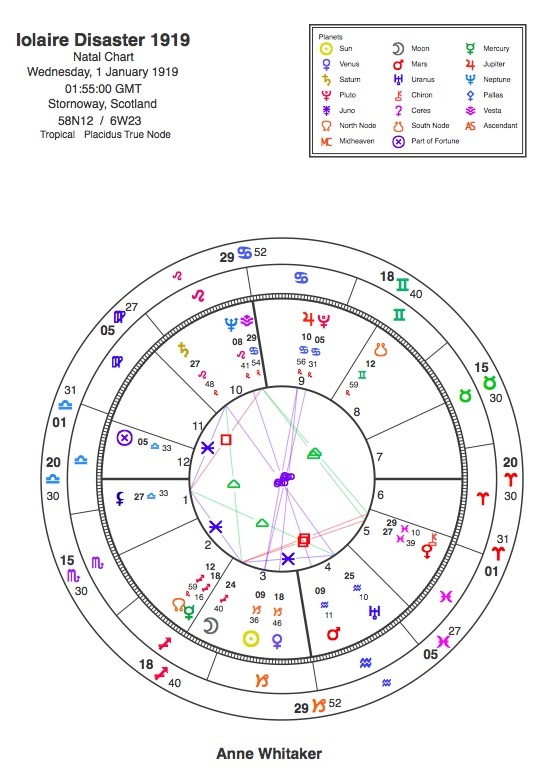 The Ascendant of the Iolaire Disaster’s horoscope, progressed to New Year’s Day 2019, is exactly conjunct the Disaster chart’s natal Moon ( MC ruler) and opposite that fateful eclipse degree. The 2019 commemorations took place just before the eclipsed New Moon in Capricorn, approaching Moondark, with transiting Saturn conjunct the Sun of the Disaster’s horoscope, emphasising the solemnity and also the respectful nature of those events. Chiron in the Iolaire Disaster’s chart is at 29 Pisces, closely conjunct Eris, Goddess of Strife at 27 Pisces. The commemorations are occuring exactly two 50-year Chiron Returns from the tragedy, Chiron currently being at 28 Pisces. Perhaps that indicates the healing which will hopefully arise in time from the creativity, dignity and eloquence with which the people of the Western Isles, and Lewis especially, have marked the most devastating tragedy ever to strike their shores. One can but hope so…. This entry was posted in Capricorn New Moons, Eclipses and the power of collective memory...the Iolaire Disaster and tagged Astrology, Cancer/Capricorn Nodes, horoscope, Iolaire Disaster 1919, Isle of Lewis, Moon's Nodes, Saturn. Bookmark the permalink. Wow, Anne. This is so rich and textured with facts, emotion, deep sadness and the perspective offered as appears in the chart. Thank you for offering this very interesting piece. It shows the power of our reflections (and feelings) to connect to others in the grand universe. I have had similar feelings when visiting the sacred ground of The Alamo here in the US (San Antonio, TX). These feelings are deeply resonant and indeed challenging to “shake”. I have heard 29 referred to as the weeping degree, that is certainly true here. And after dealing with what the tide brought in the people still found the strength to erect and maintain the memorial atop the cliffs. Respect. Mari Kosik Aubuchon Thank you for sharing this tribute with us all. Many thanks, Elaine. Are you from Lewis?